About the Zroni roll Fundraiser! "To sell or not to sell raffle tickets…. ….not to sell raffle tickets! And hence the birth of Zroni Rolls." After coming together time after time trying to figure out what the best, most unique fundraiser could be for the upcoming sports season and hearing the same old, same old suggestions….wrapping paper, coupon books, cookie dough, and the infamous “RAFFLE TICKETS”….it was then that I realized there was a need for something more exciting, more desiring and more delicious! Hence the birth of Zroni Rolls! 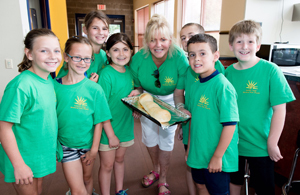 Zroni Rolls started as a “working” fundraiser….with the sports team actually producing the pepperoni rolls and experiencing a high profit return for their sales efforts and hard work. 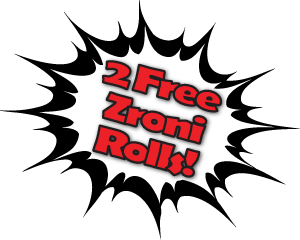 After my son graduated from high school, one of the students from the “working crew” asked if I would consider continuing to offer the “pepperoni roll fundraiser” to her school teammates and hence the actual birth of the Locally Owned and Operated Zroni Roll Fundraiser was born! Month after month students and parents alike sell the Zroni Rolls to their co-workers, family and friends experiencing the ease of selling with their customers requesting to purchase again for the upcoming month. The thought being….if I’m going to buy pizza next month why not support a student and purchase a fresh/frozen Zroni Roll….and let the proceeds benefit a student working towards a goal! We have come to realize that people are willing to support individuals in the fundraising direction as long as the customer “gets something of worth” for their support….and Zroni Rolls are not just “worth” it….they are delicious too! See for yourself how Zroni Rolls can benefit your fundraising needs….and be amazed at the response you get from your customers who are loving the delicious Zroni Rolls month after month! ©2017 Zroni Roll Fundraiser | Site designed and hosted by Hizwerks Productions.